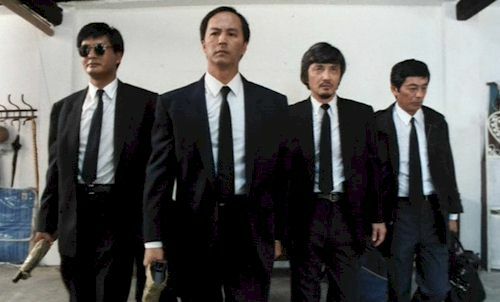 (from left to right) Chow Yun-Fat, Ti Lung, Dean Shek and Kenneth Tsang. The Skinny: It's Woo-time! John Woo returns to the director's chair for this popular sequel to his 1986 hit film. Partly a straightforward follow-up and partly a tongue-in-cheek parody, A Better Tomorrow II contains most of the celebrated Woo-isms that fans have come to love: heroic bloodshed, two-pistols-a-pumpin' action, and a little Christian symbolism to boot. No white doves though. Before Quentin Tarantino introduced the world to Vincent Vega, Jules Winfield, and those wacky Reservoir Dogs, he watched three cool cats from A Better Tomorrow II work their magic: Chow Yun-Fat, Ti Lung, and Dean Shek. Sure, this oft-imitated John Woo flick surpassed the box office success of its predecessor and helped set the standard for the emerging "gun-fu" crime genre of the 1980s, but is it really any good? Well, yes and no. First, a little refresher course: the first film involved the travails of Ho (Ti Lung) and Kit (Leslie Cheung), two brothers separated by their professions. One's a slick crook, the other an ambitious cop. As fate would have it, the two joined forces by movie's end, and along with super-cool gangster Mark (Chow Yun-Fat), vanquished the evil crime boss. But their victory had a price: Mark's life and Ho's freedom. The sequel follows Ho as he's freed from prison to infiltrate the inner circle of suspected criminal Lung (Dean Shek). Ho agrees to the deal, but only to protect Kit, who is romancing Lung's cutesy daughter Peggy in an effort to get closer to the big man. Well, somewhere in the process Peggy ends up dead and Lung gets set up for the murder of a rival triad. With the help of Ho, the innocent Lung retreats to America where, after experiencing yet another traumatic bloodbath, he promptly becomes a foaming-at-the-mouth idiot. Enter Chow Yun-Fat as Ken, Chinese restaurateur and twin brother of the deceased Mark, who nurses the helpless Lung back to health. The two new friends finally return to Hong Kong, reuniting with Ho and Kit to take down the bad guys. But the fearsome foursome lasts only so long. Tragedy strikes yet again, forcing the remaining members to go after the new crime boss on their own. But don't worry, they have guns - lots and lots of guns. Let the carnage begin.